We surveyed 1,000 Americans to see which hotels they got their sleep at. See which ones made the list. Everyone enjoys a good night’s sleep, and for proper health, we all need it. This becomes even more apparent when traveling (for business or pleasure). It’s easy to feel jet-lagged, worn out, and run down. Unfortunately, it’s not always possible to catch some quality sleep in a hotel room. For starters, it can be hard to fall asleep in a different environment than your own bedroom. And don’t forget that, of course, it’s not your bed, and not all hotel mattresses are all that comfortable. 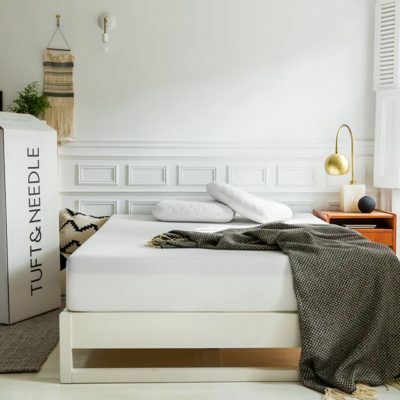 To find out which hotels have the comfiest beds for your nights away from home, we surveyed nearly 1,000 Americans on social media to see what they had to say about bed comfort in various hotels throughout the country. We also explored common complaints associated with hotel beds, and whether people rate hotels based on how good the pillows and blankets are. 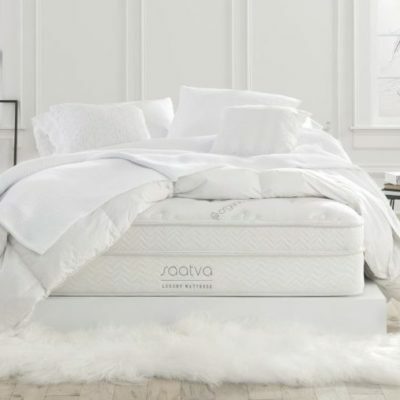 When it comes to getting a good night’s rest, comfort is of the utmost importance. If you’re looking to make some travel plans and are curious as to how some of our nation’s hotel beds stack up, then you’ve come to the right place. Keep reading to see what we found. To determine the top hotels with the best sleep quality in America, we created a metascore by looking at information gleaned from Facebook star ratings, as well as Google ratings. Additionally, we ran a text analysis on over 150 hotels and 7,000 Facebook reviews to determine a hotel’s average sleep sentiment, which we obtained by counting the number of sleep-related mentions (including beds, mattresses, and pillows) and rating each review as positive or negative. We discovered the top hotel for best sleep quality in the U.S. was found in Kentucky. There, in Louisville, you’ll find the 21c Museum Hotel Louisville. 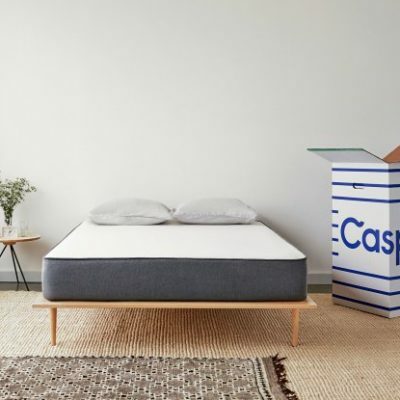 It’s no coincidence the hotel is cited for its quality sleep experience – customers can actually buy the same mattress found in their rooms, allowing them to experience blissful sleep right in their own homes. It also has a 5-star rating on Facebook. Second on the list was the West Baden Springs Hotel in Indiana, with first-rate reviews such as a happy patron who mentioned the lavish bedding and another who noted the sumptuous sheets. In Charleston, South Carolina, the third best hotel noted for sleep quality was The Spectator Hotel. 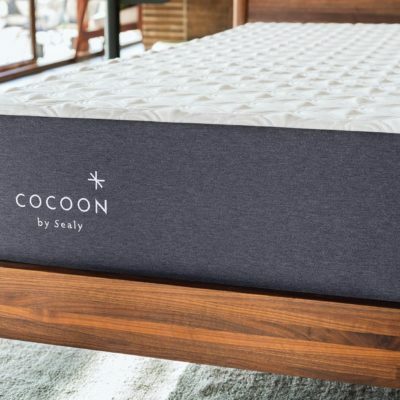 It too has rousing online praise for its sleeping experience and a 4.9 Google rating. 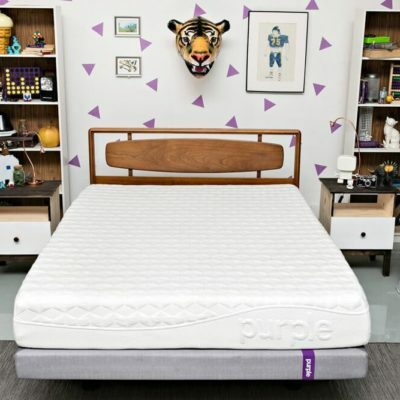 Reviews include a customer who said they had the best night of sleep there, ever. And while the superstar staff gets a lot of mentions in reviews, comfy beds aren’t far behind. Fourth on the list was the L’Horizon Resort & Spa in Palm Springs, California, which also gets many accolades for their beds, which one reviewer says was “like heaven.” Fifth was The Lodge on Little St. Simons Island in Georgia. This Georgia lodge garners top-notch reviews on Facebook with an average 4.9-star rating. Trailing behind the southern accommodation is The Little Nell in Aspen, Colorado and is noted for their comfy pillow top mattresses. The seventh best hotel for sleep quality was in Greenwood, Mississippi, at a spot called The Alluvian. Rounding out the top 10 were Hotel Emma (San Antonio, Texas), Historic Park Inn Hotel in Mason City, Iowa, and Addy’s Villas in Nokomis, Florida. 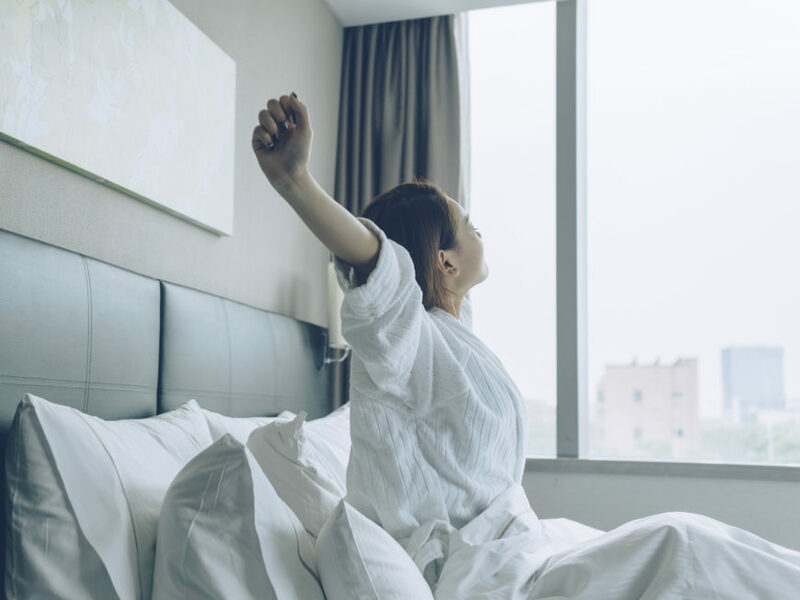 While these hotels rank at the bottom of our list, all three received positive mentions of sleep through user-generated reviews posted online. The top hotel for best sleep quality in the U.S. was found in Kentucky. Chances are if you’re making a reservation at a restaurant, looking for a new doctor, or even looking to get your haircut, you’ve probably checked out what real customers had to say about their experience before making your decision. Well, the same goes for hotel rooms – 93 percent of people who booked a hotel room made it a point to read user reviews before reserving their spot. 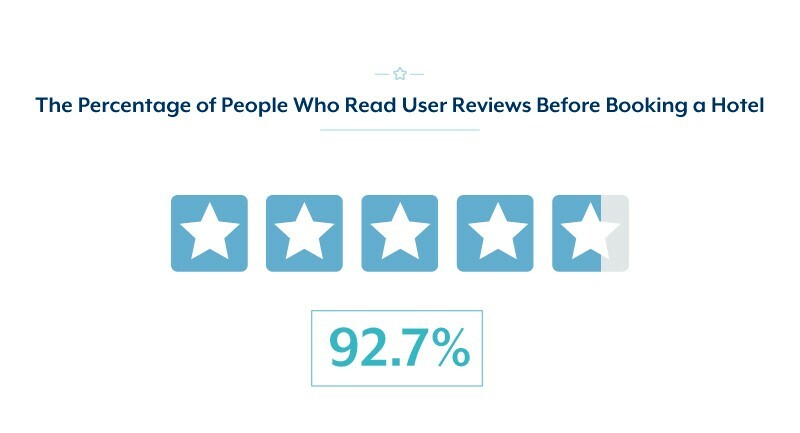 And as you’ve probably seen, users are not shy about packing lots of information into their reviews. So, what do potential customers specifically look for before booking a hotel room? According to our survey, the most important aspect of a hotel room people looked for when scanning reviews was cleanliness – a factor mentioned by 35 percent of respondents. The second most important aspect? Room comfort. Other important aspects participants acknowledged were negative reviews (9.3 percent), overall experience (7.3 percent), customer service (7.2 percent), room quality (6.6 percent), and the highest star rating (6 percent). When we looked at the differences between male and female respondents, there were a few notable discrepancies between the two sexes. For starters, women were more concerned than men with room cleanliness – women clocked in at just under 42 percent, while men sat at the nearly 26 percent mark. Overall, men were more concerned with negative and positive reviews than women were. The most important aspect of a hotel room people looked for when scanning reviews was cleanliness. Respondents overwhelmingly said a comfortable bed was the single most important feature in a hotel room, to the tune of 80.6 percent. 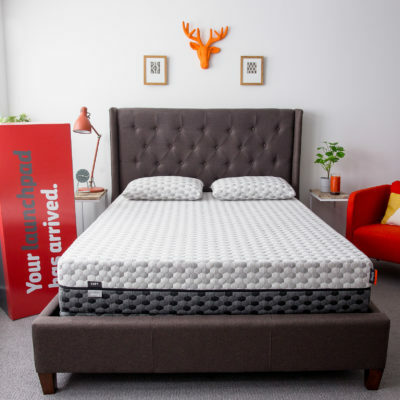 In fact, hotels have been making efforts to up their mattress and bedding game by conducting tests and visiting factories to invest in the best beds for their guests. Other important features included extra space (5.9 percent), a good view from the balcony (5.6 percent), attentive customer service (5.1 percent), and complimentary refreshments (2.8 percent). Next, we asked respondents to compare hotel sleep with the sleep they experienced in their own bedroom. 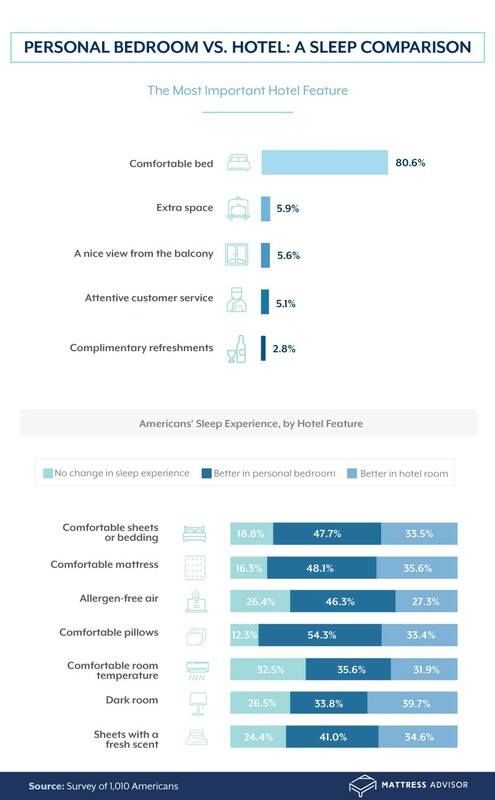 While the experiences at home were better, for the most part, there was still a pretty big chunk of participants who said their sleep experiences at hotels were solid across all categories. For example, as far as comfortable sheets or bedding went, 47.7 percent of respondents preferred their own home, but 33.5 percent said it was better in a hotel. 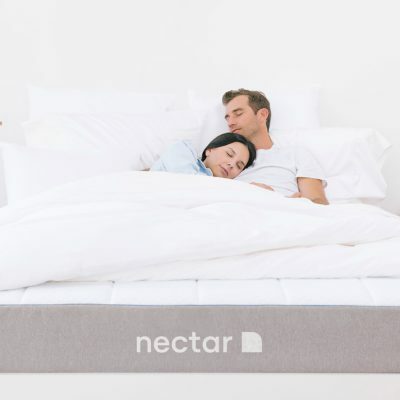 Comfortable mattress? Nearly half opted for home sweet home, while 35.6 percent fancied the hotel’s bed. 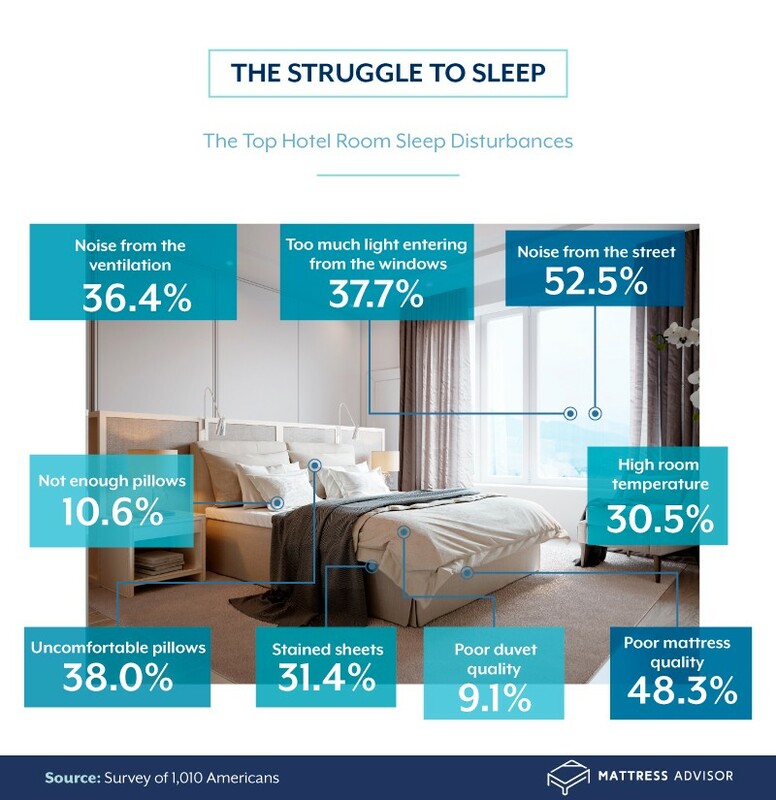 The one category where respondents said the hotel room experience was better was in a dark room – nearly 40 percent said hotels knew how to keep the sunlight out. 80.6% of respondents said that a comfortable bed was the single most important feature in a hotel room. Hotel beds are made up for your arrival, including pillows, sheets, blankets, and a comforter. 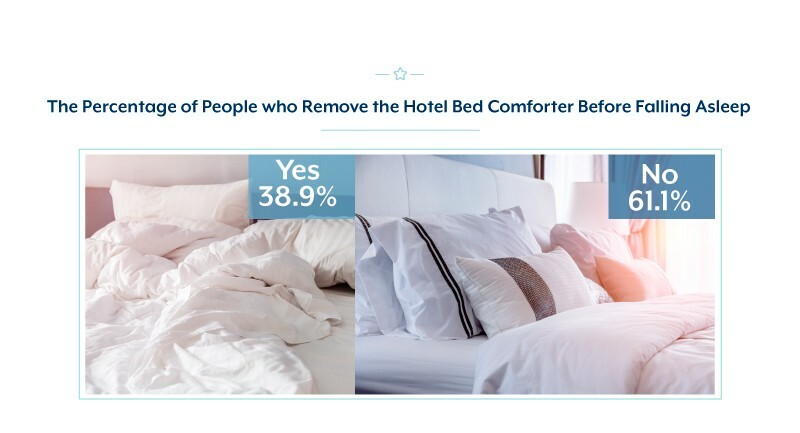 We asked survey respondents if they kept the hotel comforter on the bed before they fell asleep, and most didn’t – over 61 percent said no, while just under 39 percent said yes. Sleeping in a hotel can be blissful, but let’s not forget it’s definitely not home. There are many factors that can make a night at a hotel turn into a nightmare. Noises from the street bothered 52.5 percent of survey respondents. This isn’t a surprise, as when you sleep at home, you’re already accustomed to most noises – outside and in. 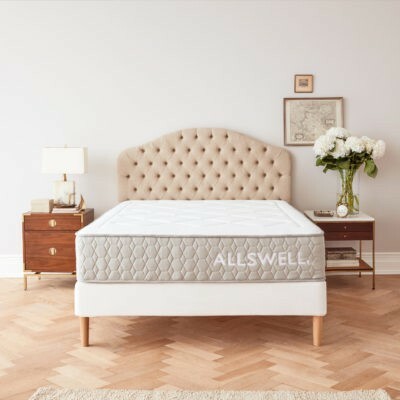 An awful mattress also scored high on our hotel sleep problems list – 48.3 of survey folks reported this had been a problem for them. 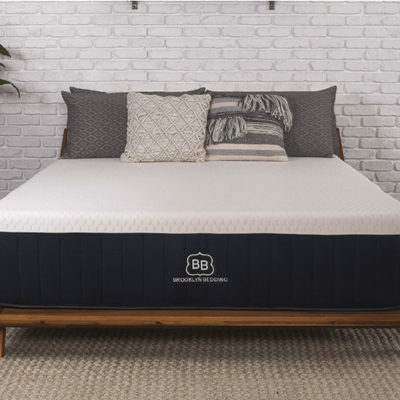 Your home bedroom has a mattress you’re accustomed to, and hotel mattresses aren’t always supportive, or soft/firm enough to everyone’s liking. Another aspect of the bed involved uncomfortable pillows. If your pillows are too hard or too soft, or you can’t mold them into the perfect form, it can really impact your quality of sleep in a negative way – 38 percent of our respondents noted this had been a factor for them. Too much light was another problem reported by participants (37.7 percent). 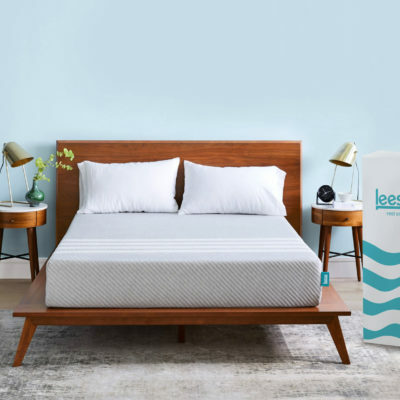 Don’t forget about stained sheets – 31.4 percent of Americans said this was a problem that caused a poor night’s rest, which isn’t all that hard to imagine. Other problems included a high room temperature (30.5 percent), not enough pillows (10.6 percent), and poor duvet quality (9.1 percent). 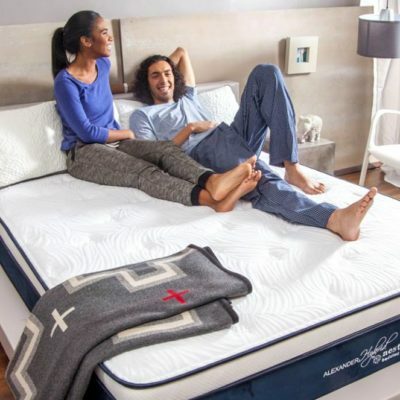 48.3% of respondents said that an aweful mattress was one of the top things that made their hotel experience less than favorable. Sleeping away from home is often a necessity, but it’s not always the perfect formula for a good, restful night of sleep. Many crucial ingredients come into play when we’re talking about a quality snoozefest, and for the majority of people, the most important hotel feature is a comfortable bed, which includes comfortable bedding, a cozy mattress, and the perfect number of pillows. 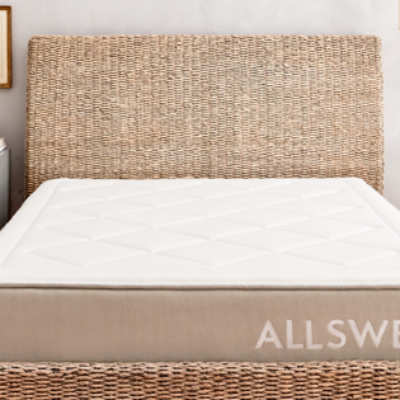 It’s important to sleep like royalty no matter where you are – that’s why Mattress Advisor has got your back (literally). 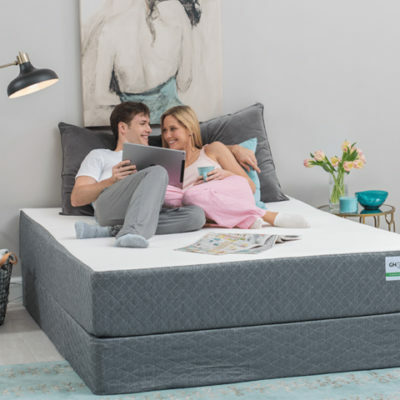 Head over today and browse through hundreds of unbiased reviews on mattresses and bedding accessories to enhance your nightly sleep experience. We collected responses from 1,010 Americans from Amazon’s Mechanical Turk. 53.4% of participants identified as female, while the remaining 46.6% identified as male. Participants were excluded if they were clearly not paying attention (for instance, failing an attention check question or entering inconsistent data). We scraped public user-generated reviews from Facebook hotel pages. The scrape was performed from 11/14/2017 at 10:20 a.m. to 11/16/2017 at 11:25 a.m. We ran all the posts through QDA Miner to analyze the frequency of sleep-related terms, as well as gauge the overall sentiment of each review. Hypotheses were then statistically tested. To determine the top hotels for best sleep quality in America, we compared 150 hotels with star ratings ranging from one to five across three key metrics: 1) average Facebook star rating, 2) average Google rating, and 3) average sleep sentiment count to form a metascore to rank the top hotels for sleep quality. We did not have a validated measure of sleep quality at hotels available to us, so we created one on our own. To determine which hotels provided the best sleep quality in the U.S., we created a metascore to rank the top hotels. The metascore takes into account three key dimensions including the average Facebook and Google ratings, as well as sleep sentiment count. 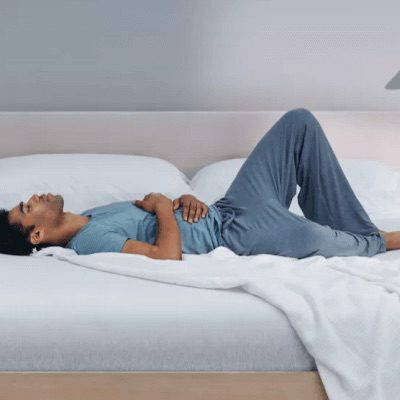 For us to measure the average sleep sentiment count, we counted the frequency of sleep-related terms (comfortable mattress, poor sleep, soft pillows, etc.) and rated each review as positive or negative. Checking out already? We’re glad you’ve enjoyed your stay and encourage you to share a “review” of our results with your audience. 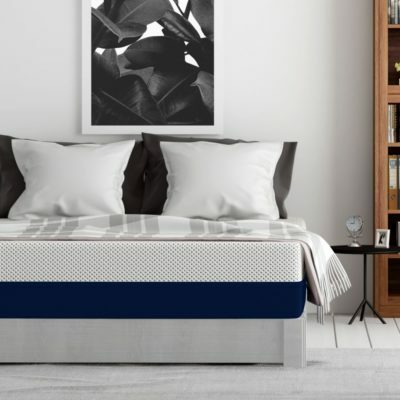 Earn a five-star rating by providing a link back to this page and crediting MattressAdvisor.com for commissioning this study.